Bullish sessions overnight in the US and Asia are set to see European indices track higher this morning. 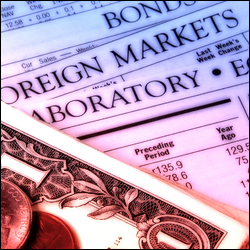 The divergent interpretation of the FOMC statement continues to spread, with stock market investors taking it as dovish but forex and bond traders taking it as hawkish. Even though oil prices continue to plunge, Russia is about to enter recession, there are rumblings in the Chinese credit markets and Greece could be about to kick off the Eurozone crisis again, risk on sentiment is set to pervade in Europe today solely because of US bullish hysteria. We saw a rally of more than 400 points in the Dow Jones yesterday to 17,792, with the US index posting its strongest 2 day gain since 2011. It seems that a dovish Fed managed to overshadow the concerns regarding growth in the rest of the world. It was the final piece of an optimistic jigsaw where encouraging US economic data and corporate earnings have already being confirmed. European stocks are set to gain following bullish sentiment overnight in the US and Asia. Quite where this bullish sentiment has come from is perplexing as equity traders viewed the FOMC as being dovish, but FX and bonds traders took it as being hawkish, sending both the dollar and US yields higher. Although she dropped 'considerable time', a dovish Fed Chair Janet Yellen offered stock markets a breath of fresh air by saying the first increase in interest rates is not foreseen 'for at least the next couple of meetings'. That indicated the Fed does not see inflation pressure yet, sparking a sharp climb in equities. As such the Dow Jones rallied 268 points to 17,354, its biggest gain since 2013. European equities are set to resume their slump on the open, tracking a timely sell off in the US. You could forgive European traders for going home with a sense of relief yesterday as it appeared that the sell off might have found a bottom. However, with impeccable timing, just after the European markets closed, the US did an about face and summarily sold off, adding another consecutive day of heavy losses. With OPEC seemingly comfortable with the volatility in the oil markets and unlikely to call an emergency meeting before June, Russia looks like it's about to implode. Everyone's starting to panic like it's 1998 and you just know that somewhere in the financial system there's another LTCM, leveraged beyond all belief, praying that the recent moves in the market are just a statistical anomaly. Just like the previous day, US stocks gave back intraday gains towards the close despite a rally in oil producers. This time the tech companies led the final hour sell off, with the Dow Jones losing 129 points overall to 17,080. Later today, investors will be closely following the FOMC meeting, wondering if the pledge to keep interest rates at record low levels for a 'considerable time' will finally be dropped. Whilst FOMC day would normally see a subdued session as traders wait to hear from the central bank, traders may go into damage limitation mode today as the geopolitical jitters get whipped up. Compared to the recent sell off, European equities are set to start with miniscule gains this morning. However, don't be fooled into thinking this is a sign of a reversal in sentiment as bargain hunters step up to the plate, it's probably more to do with shorts booking some profits following the 7-9% slumps we've seen over the last week. Indices now seem to be inextricably tied to oil prices and with OPEC saying they are comfortable with $40 per barrel, it looks like there could be a lot more pain ahead for the bulls. Initially, US stocks rebounded on the back of strong manufacturing data, with both Industrial Production and the Capacity Utilization figures surpassing estimates. However, everyone is now closely watching the sell off in oil, which seems to be taking precedence over everything else. So the Dow Jones resumed its tumble in the afternoon session, losing 60 points to 17,198. European equities are set to slump on the open as they track a late sell off in the US on Friday and a weak session in Asia this morning. Amid ongoing declines in the oil market and renewed concerns about a slowdown in Chinese growth, US stocks sank again on Friday. In particular, the Dow Jones lost more than 300 points to 17,252, posting its biggest weekly drop in three years. This came despite positive US consumer confidence data, suggesting that the bleak outlook for the global economy is overshadowing any optimism regarding the world's biggest player. Traders have also shrugged off the overnight bounce in oil prices as an overall sense of bearishness takes over. Reports that the PBoC themselves have said that Chinese growth could slow to 7.1% next year and a weak reading for the BoJ's Tankan Survey certainly haven't helped. It doesn't appear as though equities have hit a level where bargain hunters feel confident enough to come out yet. Given the time of year, with only a handful of trading sessions left before the thin holiday period, traders may decide to leave it until 2015 to be contrarian.